Sentobar can be used for the barber shop, hair salon, tattoo design, haircut, hair design and fashion. Sentobar has 3 home variations. Sentobar is Well organized and very easy to customize. 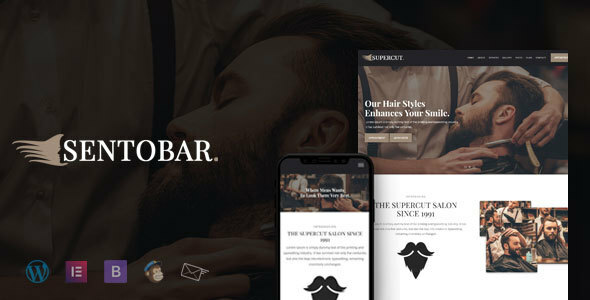 Sentobar is the better way to present and promote your barber shop, hair salon, tattoo design, haircut, hair design and fashion shop. Sentobar is fully responsive. Whatever you are browsing from mobile tablet or desktop/laptop, the Sentobar will be fit all screen sizes. Sentobar has everything you need to launch your site within next few hours! Besides, WooCommerce is supported in this themes. Elementor features bring you drag drop ability to ensure you can easily design your website. Elementor, Contact Form 7, WP MailChimp, Breadcrumb NavXT, Categories Images are included in Sentobar. Sentobar layout looks beautiful at any size, be it a laptop screen, iPad, iPhone, Android Mobile or tablets. It has the purpose oriented design, responsive layout, and special features. Sentobar includes the .POT files and is ready to be translated into your desired language. Demo images used only for demo purpose not included in the download file. You can reach us just mail us [email protected]. Support for our customers is provided on business days: Mon-Fri 10:00am-6:00pm (GMT +1). Standard reply time is within 24-48 hours.